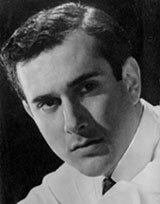 After studying at the Royal Academy of Drama tic Art and the Central School of Speech and Drama, Harold Pinter worked as an actor, mostly in repertory under the stage name David Baron, supporting himself as a waiter in the National Liberal Club, as a dance-hall doorman, as a dish-washer, and as a door-to-door bookseller. Following his success as a playwright, he continued to act, though far less frequently, on stage and screen. He continues to perform in the theatre and in films.